Exploring and enjoying the world's great cities is as easy as unfolding these sturdy laminated maps. 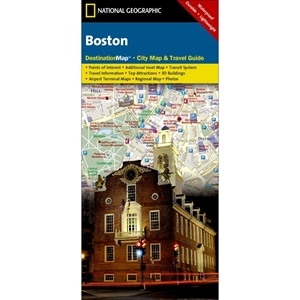 Destination Maps combine finely detailed maps with fascinating and practical travel information. 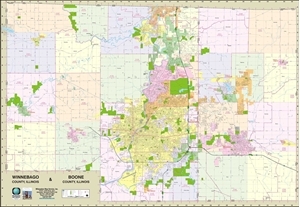 Maps feature a large-scale city map, richly layered with tourist and business travel locations and information. 3-D styled drawings provide you with instant identification of famous buildings and landmarks, making orientation easy and creating a unique keepsake of the visit. The reverse side includes regional maps, top attractions, airport diagrams, travel tips, transit maps and an extensive index to streets, cities, neighborhoods, parks, points of interest, museums, monuments, government buildings, subway stations, hotels, and more. Multi-language legends are included on each map. National Geographic's Chicago City Map & Travel Guide shows the points of interest, buildings & theaters. Also included is a map of O'Hare & Midway Airports. Map opens to size: 18" x 25"
Street level detail showing the City of Chicago. A downtown map & street index are also included. Also includes the communities of: Berwyn, Bridgeview, Brookfield, Burbank, Cicero, Elmwood Park, Evergreen Park, Franklin Park, La Grange, Lyons, Oak Lawn, Oak Park & Willow Springs. Map folds open to size: 36" x 45"
Road Map Showing the Area of North border: Wisconsin & Illinois State Line. South border: Marseilles, Bourbonnais & Bradley. West border: Harvard, DeKalb, Sycamore, & Marseilles. East border: Lake Michigan & the Illinois & Indiana State Line. Also included: Lake County Indiana. Map folds open to size: 27" x 39"
Street level detail covering the area: North Border: Jackson Blvd. South Border: 71st Street. West Border: Kedzie Avenue. East Border: Lake Michigan. Included is a map of Downtown Chicago. Map opens to size 17" x 18"
Road Map showing all of Door County peninsula including street level detail of the Cities of Egg Harbor, Ephraim & Sister Bay. Street index also included. 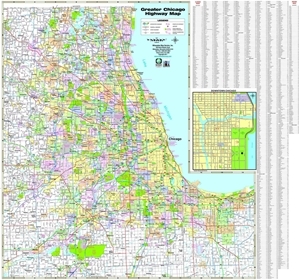 Two sizes available: 24" x 30" & 33" x 40"
Road level detail showing the area of: Wisconsin & Illinois State line on the north, Morris, Manteno & Hebron, IL on the south, Marengo & Newark, IL on the west & Portage, IN on the east. Street Level Detail Including the Communities of: Allouez, Ashwaubenon, Bellevue, Denmark, DePere, Green Bay, Howard, Pulaski, Suamico & Wrightstown. Map folds open to size: 28" x 40"
Street level detail covering the area: North Border: Wadsworth Rd. South Border: ML King Drive in North Chicago. West Border: Gurnee Mills. East Border: Lake Michigan. 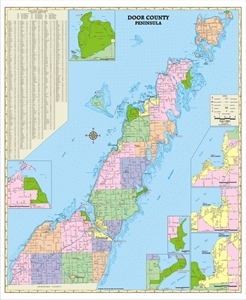 Map opens to size 17" x 18"
Street Level Detail Including the Communities of: Algoma, Kewaunee & Kewaunee County. 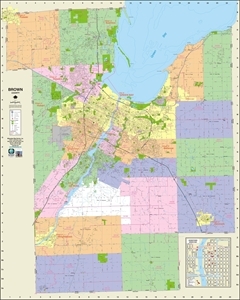 Map folds open to size: 19" x 25"
Street Level Detail Including the Communities of: Marinette WI, Peshtigo WI, Menominee MI, Marinette County WI & Menominee County MI. 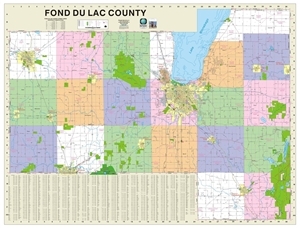 Map folds open to size: 19" x 25"
Road Level Detail including the Counties of: Door, Florence, Forest, Lincoln, Marathon, Marinette, Menominee, Oneida, Shawano & Vilas. Map Opens to Size: 27" x 39" - 2000 Edition. Street Level Detail Including the Communities of: Abrams, Lena, Gillett, Oconto, Oconto Falls, Shawano, Suring, Oconto County & Shawano County. Map folds open to size: 23" x 29"